The north part of the island (the red area) is in Maryland while the south end of the island is in Virginia; there is a fence that separates these two sides of the island. 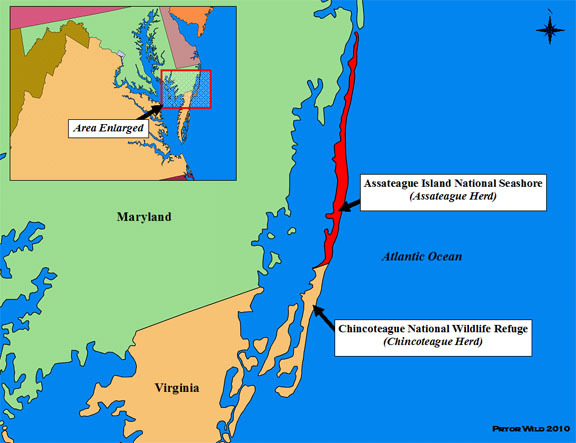 That red area in Maryland is Assateague Island National Seashore. This is a National Park Service area, and there is a herd of wild horses living there that is managed by the National Park Service. These are what I have been referring to as the wild horses of Assateague Island. This is confusing as there are other horses living on the south part of Assateague Island. This area is the Chinoteague National Wildlife Refuge. This is where the well-known “Chincoteague Ponies” are from. These horses are owned and managed by the Chincoteague Volunteer Fire Department; they are on the Chincoteague NWR through an agreement with the US Fish and Wildlife Service. These are not the horses I have been referring to as the wild horses of Assateague Island. The wild horses of Assateague Island National Seashore are managed exclusively with PZP while those of the Chincoteague NWR are managed through removals. The National Park Service took ownership of the first of the wild horses in 1968. There were 28 horses in the population at that time. Through the 1970’s and 1980’s, the population grew a lot; there were over 120 horses on the island by 1985. This same year, the National Park Service released a management plan to address the growing wild horse population and the effect that the population was having on the National Seashore’s ecological conditions. The plan recommended that the wild horse population not exceed 150 to reduce the herd’s grazing effects. The plan also allowed researchers to come in and determine how fertility control could be used to control the wild horse population’s growth rate. By 1987, the wild horse population had grown to nearly 160. Starting the next year, and continuing until 1993, forty-six mares were treated with PZP; this was the time when researchers were trying to determine if they could safely manage the wild horses with PZP. By 1994, the National Park Service concluded that PZP was safe and that it could be used to manage the wild horse population, of which there were 166 horses. A new management plan was developed that year. The plan first called for a stop in the population’s growth rate. It then had a goal of bringing the population to 150 horses and then to 120 horses. It required that this all happen without removing any horses; this was to all happen by treating the horses with PZP. In 1994, every untreated female that was at least 2 years old was given a primer dose of PZP. The plan had specific guidance in describing which horses would continue to be treated with PZP and how this would happen. From 1995 to 1998, all females were treated at ages 2, 3, and 4. After that, they were not treated anymore until they had three living offspring or a second generation existed. At this time, they would be treated each year until they died. Thus, each mare was given the opportunity to have genetic representation in the population. Once she was represented, she was not allowed to reproduce again. From 1998 to 1999, each mare was allowed to have two offspring before being treated forever. Starting in 2000, each mare was allowed to have one offspring before being treated forever. In 2006, a Population and Habitat Viability Assessment was completed by the Conservation Breeding Specialist Group in cooperation with the National Park Service and other stakeholders. This assessment concluded that if the wild horse population was at 80 to 100 horses, the resource potential of Assateague Island could be balanced with a genetically sustainable population of horses. A new management plan was developed to meet new goals found in the assessment. The exclusive use of PZP to manage the population was an alternative analyzed as was the use of removals to manage the population. Other alternatives consisted of a combination of gathers and the use of PZP. Due to public commenting and consideration of possible impacts and challenges, the use of removals was not included in the final plan. In February 2009, the final plan came out; and it again mandates that the wild horses be managed exclusively with PZP. (Please click here for more information on this latest planning process.) Thus, the wild horses of Assateague Island will continue to be managed about like it has been since 1994, when the original management plan was developed. 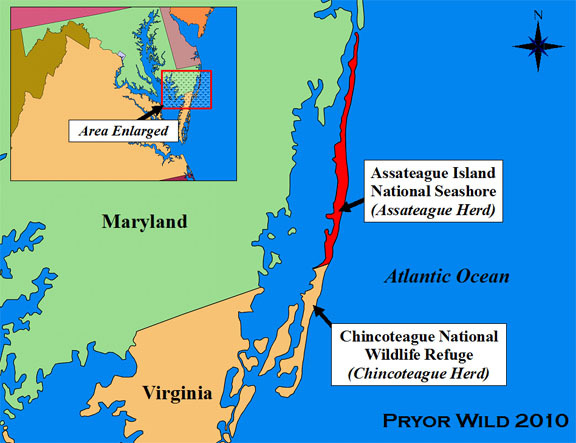 Given the length of time PZP has been used there, and the number of studies resulting from this, Assateague Island National Seashore is perhaps the most well known area where PZP has been used to manage wild horses. PZP has been, and continues to be, used in other areas as well. Next time I will write about the history of PZP and the Pryor Mountain Wild Horse Range; and I will eventually summarize its use in other areas. What great information you are providing. It must really take a lot of research time. I do hope you know how much it is appreciated. It’s fantastic that the Assateague Island herd is controlled without the roundups. I actually have some hope that the “gathers” for our mustangs may end some day! Would you mind posting some photos of the horses? Matt, Thanks for posting this information on the Assateague Island ponies and the PZP program. I only wish the western wild horses were given as much consideration and care as those on Assateague–both the NPS Assateague and the Chincoteague herds. I have a Chincoteague pony I purchased in 2007. The firemen do return some of the foal crop to the island every summer in the form of a “buy back”. The foals they select to return are auctioned off; the top bidder gets to name the foal and have their picture taken with him. This year’s top price for a “buy back” was $13,000! The NPS Assateague ponies have a program called Foster Horse Program where for a small amount of money you can “adopt” a pony and get a picture of the pony and info about it. They also had a “name the foal” on Ebay and the top bidder got to name the new foals. All good ideas that make the public part of the process. Again I believe that the BLM has a lot of catching up to do! This is all wonderful information Matt. I am wondering though how in a much larger area where there are so many more horses how it would work. Just wondering and pondering it. I have a question: In wolf populations, when there are scarce resources, the pack limits who will breed, and it’s usually the alpha female, thus insuring the best traits are passed on to the pack. If the PZP program on Asseteague allows that every mare will have one live foal, and the populations are reduced to a point where there is no real demand on the resources, so the rate of survival for all is higher with less having to “prove” themselves, wouldn’t that interfere with the herds natural selection process and possibly create a scenario where inferior genes are passed onto the herd.